« Celebrate Open Access Week with Chemical Science! For the first time, a group of scientists from University of California, San Diego in United States has quantitatively measured the strength of hydrogen bonds between two complex molecules. They also observed an abnormal trend regarding the bond strength in the absence and presence of electron transfer. This work contributes to the understanding of how the hydrogen bond strength changes, an important point that reveals the way biological systems function. Hydrogen bonds are a type of electrostatic attraction between hydrogen atoms and certain highly electronegative atoms including N, O and F. These bonds help to bind individual water molecules together and keep water as liquid at room temperature, a critical condition for the origin of life. 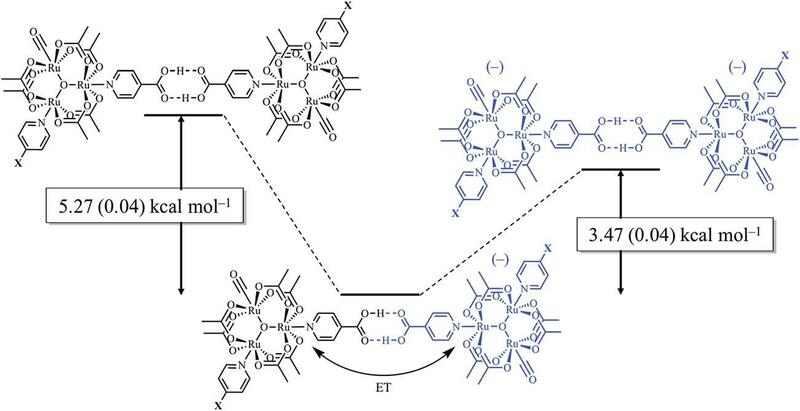 The researchers, led by Prof. Kubiak, picked two ruthenium-based complexes joined by hydrogen bonds as their studying platform. As shown in Figure 1, the two-molecule system has three states depending on whether the ends are charged or not: the neutral state when both ends are not charged (left), the singly reduced state when only one end is negatively charged (middle), and the doubly reduced state when both ends are negatively charged (right). The group utilized infrared spectroscopy, UV-vis spectroscopy and electrochemical measurements to experimentally determine the strength of hydrogen bonds in these different redox states. The results from the study found that the hydrogen bond energy of the neutral state and the doubly reduced state was in the range of 2.56-2.88 kcal/mol and 4.50-4.63 kcal/mol, respectively. Surprisingly, the hydrogen bond energy of the singly charged state did not lie between that of the neutral state and the doubly reduced state. It ranged from 7.78 kcal/mol to 8.31 kcal/mol, indicating the hydrogen bond is much stronger than for both the neutral and doubly-reduced states. The authors ascribed such an abnormality to the reinforcement brought by electron transfer i.e., the movement of the negative charge between the two ends. This work is the first demonstration that hydrogen bond strength can be significantly enhanced by electron delocalization. Tianyu Liu is a Ph.D. in chemistry graduated from University of California, Santa Cruz in United States. He is passionate about scientific communication to introduce cutting-edge researches to both the general public and the scientists with diverse research expertise. He is a web blogger for the Chem. Commun. and Chem. Sci. blog websites. More information about him can be found at http://liutianyuresearch.weebly.com/.